How the buying power calculator works? If you've ever wondered how the real value of a certain amount of money changes over the years, this buying power calculator will surely give you some practical insight. 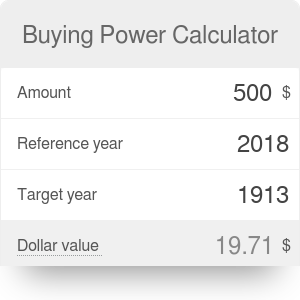 In other words, this buying power calculator (or purchasing power calculator) shows you how much your dollar is worth in different years. If you read further, you can get familiar with the purchasing power definition. You can also learn about why changes in the real value of your money are important in economics. Dollars from different years don't represent an accurate comparison of their real value. Practically, it means that you can't buy the same amount of goods and services with the same amount of dollars in different years. For comparing the value of dollars in particular years, the older figure should be adjusted by a price index. Purchasing power corresponds to the value of a currency expressed in terms of the amount of goods or services that one unit of money can buy. Purchasing power is strongly linked to the inflation, one of the most important macroeconomic indicators. To demonstrate how the purchasing power calculator works, let's consider the following query. 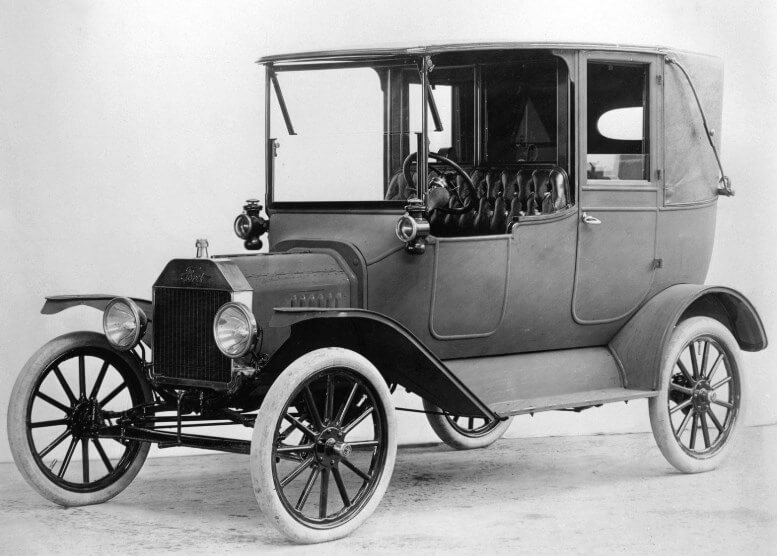 In 1913, the price of a Ford Model T was around 500 dollars which was a considerable part of the average workers yearly wage of about 1,300 dollars. Now, let's consider how the worth of these 500 dollars changed from 1913 to 2018, i.e. how the buying power changed. To answer this question, we need to multiply the amount of dollars by the ratio of the price index in 1913 (reference year) to the price index in 2018 (the target year). According to the purchasing power formula, 500 dollars from 1913 would be worth less than 20 dollars in 2018, which is hardly enough to tank up your car: this money is a tiny fragment of a price of any new vehicle sold in 2018. It may seem shocking, however, what really matters is not the nominal price but its relation to your income. In 2018, the average yearly wage exceeded 50,000 dollars, and you could buy a new basic Ford model for around 15,000 dollars. Thus, on average, you could afford a car purchase which is undoubtedly far more advanced than the one from 1913, from a smaller part of your yearly income. If you would like to look into whether your wage is keeping up with the buying power of the dollar, check out our salary inflation calculator. As you probably already know, the higher the inflation, the larger the loss in the buying power of your money or savings. As the range of goods and services that you can buy with the same amount of money is shrinking according to the eroding power of the cash in your wallet (or deposits on your bank account), people are more inclined to spend their money instead of holding it. This process can be tolerable or even beneficial for the economy, as it may stimulate spending, which would then contribute to a higher GDP. However, an extended precipitous decline in the buying power is an extremely dangerous phenomenon that corresponds to so-called hyperinflation. Buying Power Calculator can be embedded on your website to enrich the content you wrote and make it easier for your visitors to understand your message.